What's Wine and Canvas you ask? Just the best way for non artistic people to get to paint a semi-professional looking picture in a couple hours! Held at different venues around town (east, west, and south), each painting event features a different theme. For instance, I went to Claddagh in Legacy Village to paint some sad looking birch trees, but you could go to Pickle Bills and paint a replica of Starry Night, Strongsville to paint palm trees, or one of many other locations around Cleveland and Akron to paint a picture that appeals to you. Classes are $35 and that includes your canvas, all the materials you need, and step by step instruction. (including instructions on how to fix painting boo boos...not that I needed any help with that...ahem) You start off with a completely blank canvas...and in no time, you have a masterpiece. Or at least something you wouldn't be embarrassed to hang up in your house. I think this is a great activity for a girls night...even though I went with my boyfriend. He wasn't the only guy there, though, so guys - don't be afraid to check out Wine and Canvas Cleveland if this seems like something you'd be interested in doing. There was a really diverse crowd of people at this event (event though the "girl power" music they were playing was a little much for me) so whether you're young, old, male, or female...I think you'd enjoy a Wine and Canvas event. Even if you have no artistic ability! P.S. 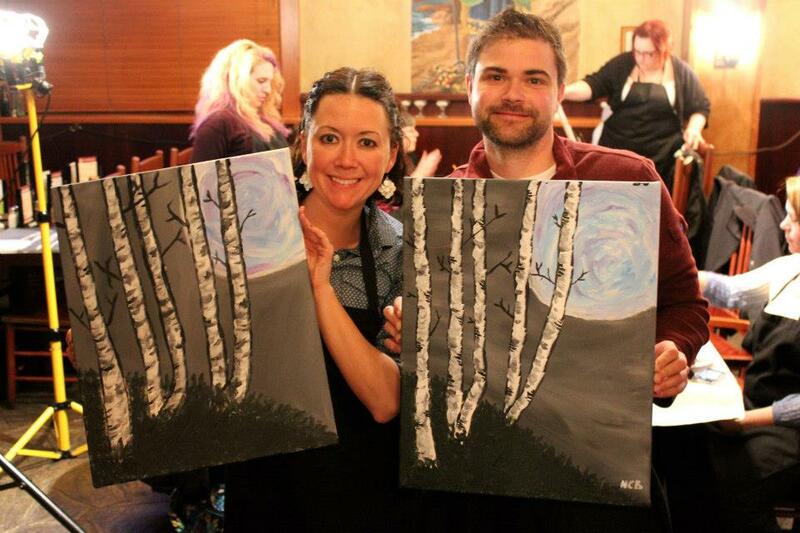 If you're reading this and you don't happen to be in Cleveland or Akron, Wine and Canvas has locations across the U.S. so you can join in on the fun even if you're not here in the CLE!